In previous articles, I’ve often claimed that the Energy Return on Energy Invested (ERoEI) for energy efficiency measures is much higher than the ERoEI for Renewable or fossil energy generation. This was based on the logic that a high ERoEI is needed to sustain the high financial returns from energy efficiency. 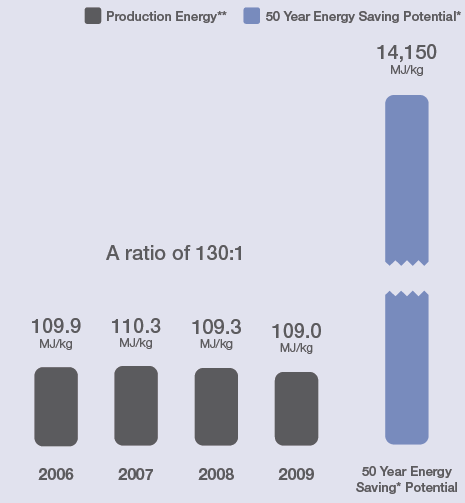 Unfortunately, there are few studies of the energy return on energy efficiency, so most of my evidence was anecdotal. Since ERoEI is a flawed measure, I also calculated the Energy Internal Rate of Return (EIRR), using both 25 year and 50 year lifespans… they worked out to be 262% and 264%, respectively. For comparison, the highest EIRR I’ve found for a energy generation technology is 205% for wood cofiring. The EIRR for a wind turbine is around 84%, and a combined cycle natural gas plant has an EIRR about 164%. In otherwords, insulation is a slam-dunk when it comes to energy economics. That’s no surprise, but it’s nice to have some numbers, so we have a better idea of just how good a slam dunk it is. Good to see an EROI post for insulation. The passive house project proposes a very low energy house. They are based in Germany. It would be very informative to have an EROI for the additional works involve, over what might be called a substandard house..And it would be useful to have one for engine driven heat pumps to provide heat for the vast existing stock of substandard dwelllings plotted against insulation improvement. Your wonk is wondeful, thank you. Interesting thoughts Joesph, although I don’t think a properly designed PassivHaus needs a heat pump. As I understand it, passive solar heat gain is enough nearly all the time, so the expense of a heat pump would probably not be justified for the 1-3 days a year it might be needed. On the other hand, heat pumps are great technology, but they’re best in retrofit situations where it’s not possible to insulate to the level of a PassivHaus, and the heating and cooling load remains significant. I don’t think Joseph was talking about heat pumps for passive houses – although they do tend to have mechanical ventilation with heat recovery and also some sort of back-up heating like a log stove in many cases. Also, the benefit of heat pumps depends on what they’re replacing, what they’re fuelled with, and the coefficient of performance. In the long run they’re probably the only game in town (assuming biomass is limited as in the UK, and that fossil fuels are on the way out), but in the short run if there’s an alternative natural gas supply it’s a close run thing. And I’m only talking about air source, not ground source here, but that depends much more on suitable location. On the other hand, solar thermal may give heat pumps a run for their money, especially when combined with thermally driven dessicatant cooling in the summer. Good find, Tom. This is exactly the question that first interested me in EROEI at a workshop at my old uni. We found EROEIs in the range of 100 – 200 too for mineral wool loft insulation, depending on thickness. My MSc thesis was on a similar topic. Looking back, I didn’t explicitly calculate a carbon return on carbon investment (CROCI) so that might be a forthcoming post if I can dig the model out. I did find that the carbon-optimal level of insulation is far beyond the financial-optimal level. This was defined as the point where adding another 10mm had equal costs and benefits over an assumed 50 year lifespan. The same is probably true for these SIPs. On the topic of embodied energy of passive houses, there is a review article in Energy and Buildings journal looking at the relative embodied and operational energy use of low-energy buildings. I’m fairly sure they’ve also covered LCA of passive houses too. The biggest leap in embodied energy seems to be if you move from zero-net operational energy to self-sufficient and have to start relying on batteries. The annual report also gave numbers for GHG savings. They calculated 8,958 metric tons of CO2 emitted in insulation manufacturing in 2009, with annual GHG savings from the same insulation of 56,153 metric tons. Over a 25 year lifespan, that’s a ratio of 157 to 1, or 313 to one over a 50 yer lifespan. Since the “GHG return on investment” is over twice the “Energy Return on Investment” it makes sense to me that the GHG-optimal level of insulation would be considerably higher than the energy-optimal level of insulation. Put simply, energy prices are too low to account for GHG externalities. If energy prices accurately reflected GHG emissions, the GHG optimal level of insulation would be very close to the energy-optimal level of insulation. Well exactly. And in fact, the EROEIs don’t even include the full energy costs. I’m thinking the costs of adapting to, cleaning up and even avoiding any further climate change ought to be on the balance sheet of fossil fuelled energy. This was firmed up by a post by Gail the Actuary of The Oil Drum where she wrote about the shift in EROEI you get from cleaning up after an oil spill – but the same ought to apply to the energy costs of all the externalities. Fossil-fuelled electricity is far enough behind most renewables already. Once those external costs are brought in, there can’t be much left before all we’re doing is creating an energy debt for the future. Tom, I believe in the high value of insulation. As an investor, how can I invest in insulation, beyond PBFOF? I’m guessing you don’t see any other companies that are compelling investments, or you would have mentioned them. There’s also Owens Corning (OC). I have not looked at the valuation recently. Thanks for responding. I’d love to see you do another article (at altenergystocks.com) analyzing what might be the right entry price for OC or other companies doing major business in insulation. I just bought stock in Lowe’s, which Morningstar highlighted as a good buy at $25. It helps that they sell insulation and new energy efficient appliances.